Western tarnished plant bug (Lygus hesperus), which is generally referred to as lygus bug, is a major pest of strawberries on the California Central Coast. Lygus bug feeding on developing berries causes fruit deformity. Deformed or ‘cat-faced' berries are not desirable for fresh market and lygus bug damage results in significant yield losses. Lygus bugs typically move into strawberry fields in early to mid-spring and thrive in fall-planted and summer-planted fields during the following months through multiple generations. Degree-day calculations and timing of treatments is difficult for lygus bug management in strawberries due to multiple sources (wild and cultivated hosts) and continuous movement of populations among different hosts. Conventional growers typically rely on pesticide applications and use of bug vacuums is gaining popularity in the recent years. 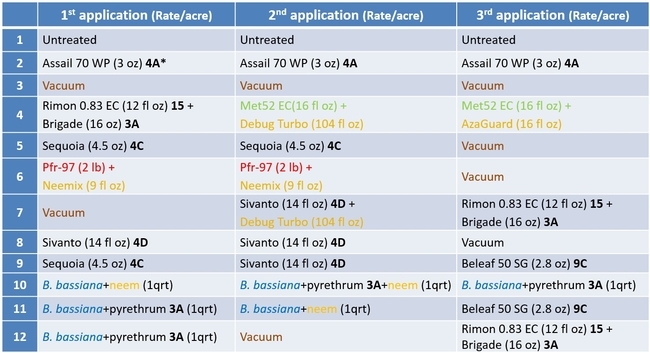 Lygus bug management continues to be a challenge with these tools and emphasizes the need for IPM strategies that use several control options. Studies conducted in 2012, 2013, and 2014 in commercial Santa Maria strawberry fields showed that non-chemical alternatives such as azadirachtin, entomopathogenic fungi, and bacteria-based pesticides can play an important role in managing lygus bug and other insect pests. Such botanical and microbial alternatives were also critical in managing twospotted spider mites. IPM approach beyond rotating chemicals among different modes of action groups is necessary for obtaining effective control, maintaining environmental sustainability, and reducing the risk of pesticide resistance. An IPM study was conducted in 2015 at Sundance Berry Farms in the Santa Maria area using almost all available IPM tools. 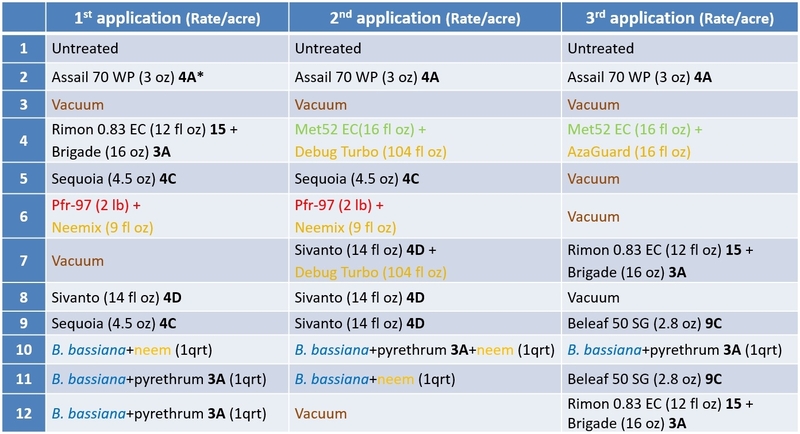 The following groups of options were used in different combinations and rotations and evaluated for their efficacy against lygus bug, western flower thrips, and greenhouse whitefly. 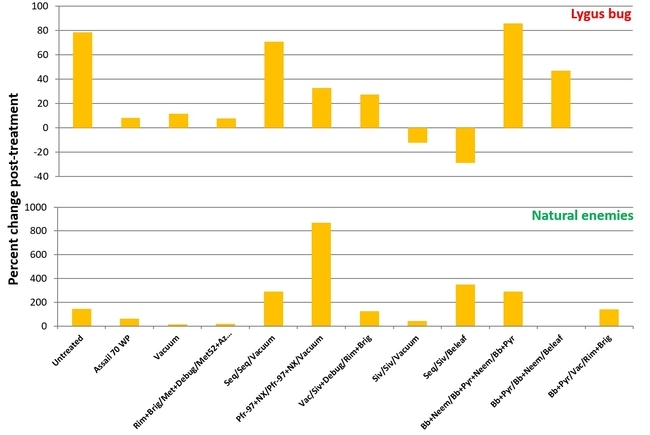 Chemical pesticides: Pyrethrins (formulations proprietary and Brigade, IRAC mode of action group 3A – sodium channel modulators), neonicotinoids [(formulation Assail 70 WP, IRAC group 4A), sulfoximines (formulation Sequoia, IRAC group 4C), and butenolides (formulation Sivanto, IRAC group 4D) – all of them are nocotinic acetylcholine receptor competitive modulators], flonicamid (formulation Beleaf 50 SG, IRAC group 9C – modulators of chordotonal organs), and benzoylureas (formulation Rimon 0.83 EC, IRAC group 15 – inhibitors of chitin biosynthesis). Botanical pesticide: Azadirachtin (formulations cold pressed neem, Neemix, AzaGuard, and Debug Turbo), which is an insecticide, insect growth regulator, antifeedant, and a repellent. Mechanical: Vacuuming twice a week at one pass each time at 2 mph. The study included 12 treatments that included an untreated control, Assail 70 WP alone and vacuuming alone as grower standards. Treatments were administered on 26 August, 2 and 9 September, 2015 using a tractor-mounted sprayer. A spray volume of 100 gpa was used for pesticide treatments. Each treatment had six 75' long (4 row) beds and four replications distributed in a randomized complete block design. Before the first treatment and 6 days after each treatment, 20 random plants from the middle two beds in each plant were sampled for insect pests and beneficial arthropods. Number of young and old nymphs, and adult lygus bugs, thrips, adult whiteflies, big-eyed bugs, minute pirate bugs, lace wings, damsel bugs, ladybeetles, parasitic wasps, predatory thrips, predatory midge larvae, and spiders were counted from each sample plant. Data were subjected to ANOVA and significant means were separated using Tukey's HSD test. 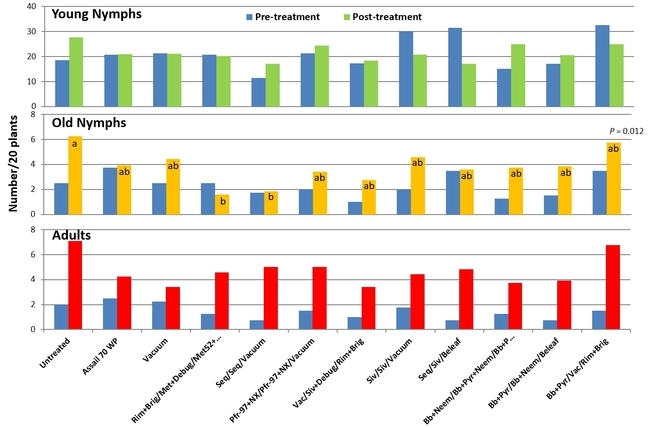 Pre-treatment and post-treatment (average of three counts) numbers of lygus bug nymphs and adults in different treatments. Lygus bug: Lygus bug populations were very high during the study period (treatment threshold 1 nymph/20 plants) and control was difficult, in general. Sequoia/Sivanto/Belaf rotation provided the highest control where there was a 29% reduction in all life stages compared to pre-treatment numbers. Sivanto/Sivanto/Vacuum treatment was the only other treatment that provided a 12% control. B. bassiana+pyrethrum/Vacuum/Rimon+Brigade treatment prevented the population buildup and lygus numbers increased in all other treatments. The popular practice of vacuuming was ranked 6th. Having two passes instead of one pass might increase the efficacy of vacuuming, but results emphasize that multiple tools need to be considered for managing lygus bugs in strawberries. Natural enemies: Percent change post-treatment indicated that natural enemy populations were relatively higher in Pfr-97+Neemix/Pfr-97+Neemix/Vacuum followed by Sequoia/Sivanto/Beleaf, and Sequoia/Sequoia/Vacuum and B. bassiana+neem/B. bassiana+pyrethrum+neem/B. bassiana+pyrethrum. 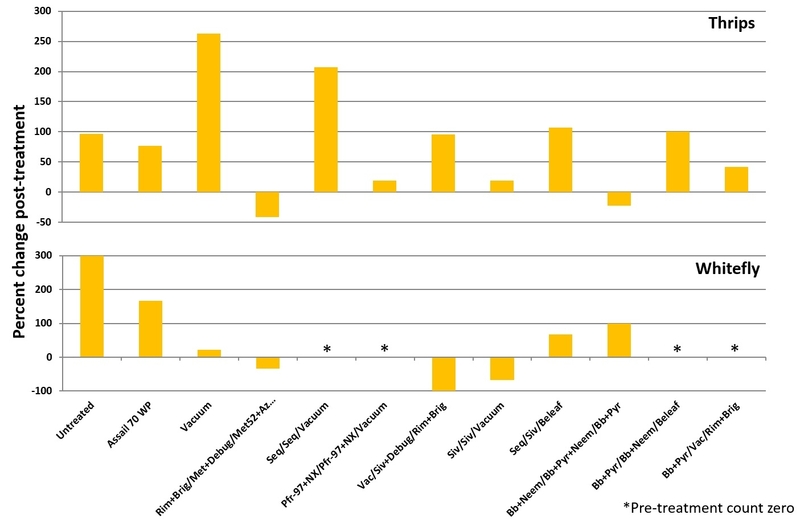 Western flower thrips: Post-treatment counts showed that thrips populations were reduced only in Rimon+Brigade/Met52+Debug Turbo/Met52+AzaGuard and B. bassiana+neem/B. bassiana+pyrethrum+neem/B. bassiana+pyrethrum treatments. Greenhouse whitefly: Adult whiteflies occurred at very low numbers during the study and population reduction from post-treatment counts was seen only in Vacuum/Sivanto+Debug Trubo/Rimon+Brigade, Sivanto/Sivanto/Vacuum, and Rimon+Brigade/Met52+Debug Turbo/Met52+AzaGuard treatments. 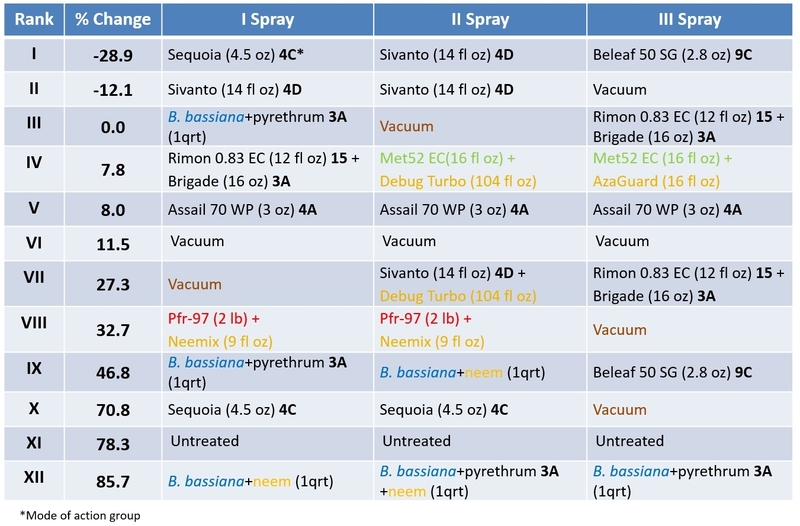 This study demonstrates the efficacy of various chemical and non-chemical tools in various combinations against lygus bug, western flower thrips, and greenhouse whitefly and growers can make appropriate treatment decisions based on these results. Acknowledgements: Thanks to Dave Murray for collaborations with this study, Ted Ponce for coordination, Sundance Berry Farms crew, Chris Martinez, Fritz Light, Tamas Zold, and Kristin Nicole Stegeman for their technical assistance, and industry partners for the supply of materials and/or financial support.